A blustery winters day in The Blue Mountains, but as I approached Cabramatta I could feel it getting warmer. I even took my coat off once I arrived. Its always fun to Sketch in Cabramatta. It would have to be the best suburb in Sydney! In terms of sketching and chefs delights, does it get any better? I met our lovely group at The Water Buffalo on Freedom Plaza, then we headed for a Vietnamese Coffee. Some of the group ordered all sorts of different drinks on the menu that I didn't even know where Vietnamese. Actually, I think some of them were not! I always encourage students to try the Ca Phe Sua Da. Vietnamese iced coffee made with sweetened condensed miljk. 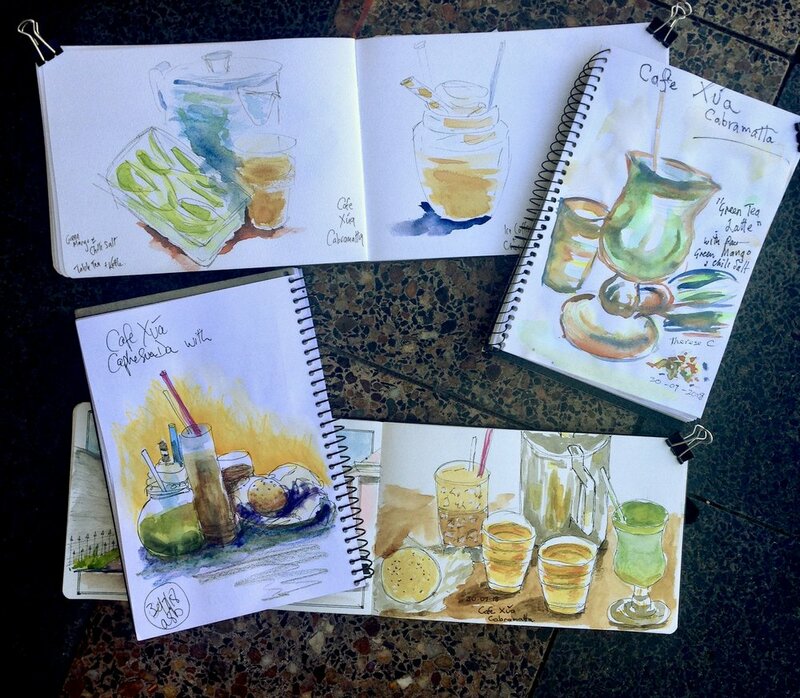 Did you know that Vietnam is the second biggest coffee grower in world We sketched, then we shopped the local markets. I helped students choose the best fish sauce, the most cinvinient Pho spices and how to interpret the rice noodle selection. Then we headed through the suburb for a delicious lunch and some more sketching. Next Sketch&Lunch is August 27th in China Town. We will be eating Malaysian. Bookings here.